What Is the French Country Style? At heart, French country style is feminine without being cloying, colorful without being overly bright, welcoming without being too sentimental and casual without being sloppy. It blends an old-world sensibility with cheerful colors, patterns, and materials to banish any trace of stodginess, and it adapts easily to influences from other decorating styles, even contemporary looks. It’s no wonder that French country never goes out of fashion—this warm, welcoming style is perfect for the bedroom. If you’d like to make it your own, read on for some great tips and ideas from professional designers and homeowners on how you can create a beautiful French country bedroom. 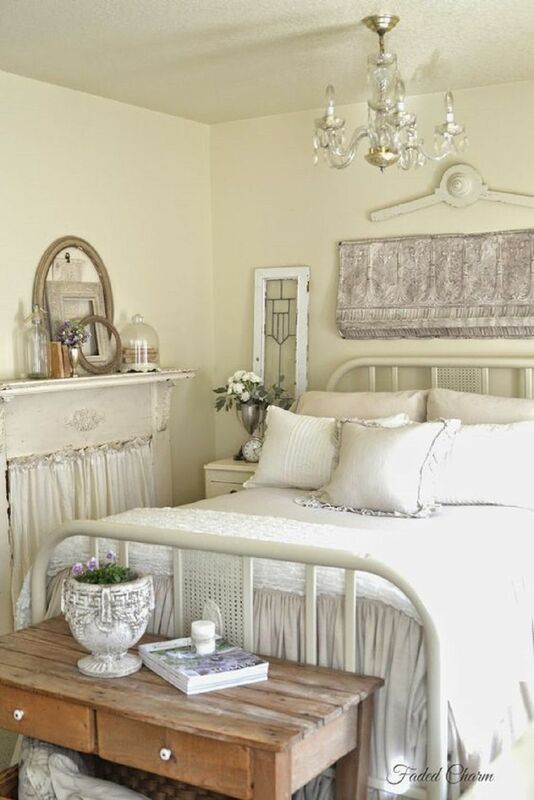 The lovely room shown here is from blog Faded Charm. The French country decorating palette includes a variety of airy, pastel hues punched up with strong, vibrant accents. You’ll find a great deal of creamy white and pastel tints of orange, yellow and red set off by cheerful shades of gold, sage green, burgundy, sky blue, and black. As befits a country style, the palette includes colors found in nature—this isn’t the decorating style for extreme brights or metallics. Often, the colors are combined in unexpected ways, but the overall vibe is never garish or busy. Just take a look at the lovely bedroom designed by Tucker & Marks, Inc. shown here—the palette is rather muted, but there is nothing drab about it. In fact, it’s quite warm, cheerful and relaxed. Despite a palette that is typically fairly subdued, a French country room is certainly not boring or without contrast. Layered fabrics, a variety of patterns, and a range of textures, wonderful interest, even if the color range is small. In this serene bedroom, the bed has several layers of fabric. There is plenty of texture in the fabrics, curtains, wooden furniture and flooring, and wicker headboard. Beautiful, elaborate canopies are often found in French country bedrooms like this luxurious guest room designed by Cabell Design Studio. This style of a canopy, also called a bed crown coronet, is a wonderful decorative element perfect for any room where a touch of romance would be appreciated. Another staple of French country style is crackled or distressed furniture, such as the dressing screen, antique chair and bed shown here. You don’t need to spend a fortune on antique or vintage furniture, however—you’ll often find inexpensive, yet still sound, pieces at flea markets or similar venues, or you can distress a new piece of furniture yourself. Courtesy of Simon Brow. Reprinted with permission of the publisher. All rights reserved. The eclectic flair of French country style makes it easy to combine unique décor, romantic headboards, and personal touches. As a lovely example of the theme’s flexibility, take a look at the understated and elegant room from Flea Market Chic by Liz Bauwens and Alexandra Campbell shown here. The lovely poem written above the bed is hand-painted, but you could achieve the same effect with stencils or decorative wall stickers if you don’t trust your artistic abilities. Although French country is generally associated with a palette of warm golds, burnt reds, creamy whites, and neutral browns, that doesn't mean it's limited only to those hues. Here, a gorgeous bedroom from Ashbourne Designs shows off the loveliness of pale blue mixed in with more traditional French country colors. French country isn't afraid to mix and match a pattern, as this lovely bedroom from blog Opulent Cottage proves so beautifully. The quintessential French country pattern, of course, is toile—shown off beautifully here in the curtains. Other patterns you'll often find in the French country home are florals, (lots of them in the bedroom here) stripes, chinoiserie, gingham, and checks. If traditional French country is a bit too much for your tastes, feel free to give it a bit of an update, as in this room from Thistlewood Farms. There are plenty of traditional touches—the layered fabrics, the rustic wood, the wrought iron chandelier, the leather bench—but what's gone are the typical patterns, motifs, and ornate touches often found in this style. Instead, you get a space that is classically beautiful, very restful, and in no way outdated or fussy. Another palette not uncommon in French country decor is one color plus white, as shown to perfection in this red and white bedroom. Red, yellow, and black are the colors most often used to offset the white, but you can choose whatever color is your favorite. The warm, rustic French country style is especially associated with southern France, which is reflected in the bright, cheerful mixture of antique furniture, lively color schemes and whimsical decorative motifs such as roosters, toile and flowers. It’s a look that is cozy, welcoming and casual, yet still filled with old-world elegance. Cozy, inviting and a little bit eclectic—that’s the French country take on bedding. You’ll typically find several types of fabric combined on the bed, along with a variety of accent pillows. White sheets are most common, set off by bedding decorated with a French country motif: toile, paisley, and florals are very popular. A great example is this enchanting French country bedroom designed by Jennifer Latimer & Gilded Mint, which uses a combination of floral accent pillows and matching comforter set. What's the Difference Between Primitive, Rustic, and Country? Tuscan Bedrooms: What is the Tuscan Style?